Whoah! Was I was surprised! 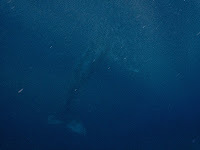 A Humpback Whale surfaced less than twenty yards in front of me on my ocean swim this morning. By the time I pulled the camera out, powered it on and clicked the button, all I managed was the faintest outline of its tail and body. It was still quite close but they blend in amazingly well. 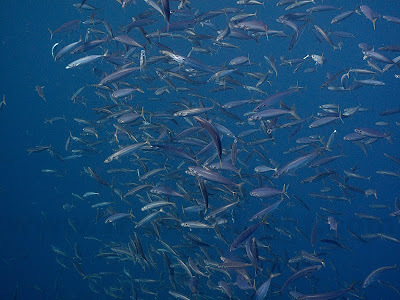 Then came a giant school of what I call "whale fish." When I see these fish there is usually a whale nearby. Duh! So I floated with them for a while, hoping to see something (dolphin or shark) come by for lunch, but no luck today.